For the stage 6 boss jamming trick its actually really easy to do. Just make sure you go as far right as possible, position yourself at the absolute correct pixel level, and then move left. You plane will instantly become jammed and no matter what you press you cannot get out of it, it only ends once the boss hits you out by moving to the right. Need to figure out the boss 7 trick. You plane will instantly become jammed and no matter what you press you cannot get out of it. I'm almost sure that I never managed to stay trapped so easily, and that I've been kicked out sometimes. I suppose it's a matter of precision with the initial trapping. I'll try it again tomorrow! By the way, how much points did you manage to earn with this trick? I think it was around 50.000 points for me. Does your apparently better way lead to more? Lets move the discussion to the strategy section. Successfully pulled off the stage 6 boss jamming trick. Not like he'll post it. Macaw gave me permission to take over his Batrider thread. I didn't ask explicitly, but this probably extends to his other threads like for NMK games, since he hasn't been updating those either. If there are no objections, I can take over those as well. Go right ahead. Take up the TD2 thread while your at it. I think I'll hold onto the Rapid hero, p47 aces and TD2 threads for now, but if at some point I cant be bothered continuing with them I'll let you know Enhasa. This is a better solution since I'm lazy by default. Also I don't want to make like 10 new threads at once, although if anything that would probably be easier for Zach or whichever mod edits the index. I doubt I'll play this game again, the end of stage 5 disguts me. This game isn't meant to be beaten, is it? More people should play this, one of the coolest horizontal shooters ever! Attempt to knock Macaw off his perch! Bumping this for the sake of the post above mine; just gave it a try the other day and even more today. It's actually a pretty badass hori. And the input lag is minimal in Mame. I noticed that between Mame .99 and .133 the sound is emulated a bit better. But some of it still sounds pretty crap . I think I might try to get serious with this one, it looks like it's damned hard... no one here has cleared it. Looking to bag the 1cc... this was actually the first time I got past stage 3 on one credit. (I've just been practicing with save states all the rest of the time.) I learned from this run that I should save my bomb stock till St. 7 boss, and use extra bombs on that boss if I need to. 'Cause I lost a life on that boss, and it ruined me in St. 8 where full power is a lot more handy. Albiet practicing the st. 7 boss a ton, it's just a hard one to crack without dying, reliably. But yeah, one lifed it up to St. 7 with 3 or 2 bombs in stock. With 2 lives and starting St. 8 with full power, I'm confident I'll be able to 1cc this one. Really awesome game, damn. If you mean something like the sound desync'ing and getting delayed, like in stage 2, thats actually how the real PCB behaves! Strangest thing I've ever seen. Yaaay. What an Ace game... ho ho ho. I have discovered that the music is emulated very slowly upon listening to the PCB soundtrack. I think this is either a voltage issue, or differences in the motherboard. When i played this in one of my cabinets at home, I got the delayed sound effects when you pick up items, but then I brought my cart to a meet in Germany and put it on another motherboard and the sound was perfectly in sync. 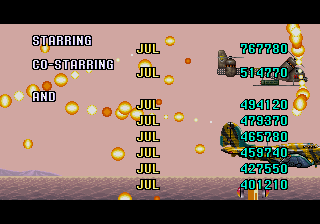 That was considerably better than my previous best, and I just played a few times to get to it (no restarting once past the first stage boss). Alright - the end of that run was depressing though. I got to the stage 3 boss for the first time, had a life. Died, picked up a bomb that appeared, so what do I do? I move to the left of the boss and promptly get killed. I had hit the bomb button at the same time (was going to try to just bomb past it with full stock) but no such luck. Man, getting past all those planes at the end of Stage 3 was awesome. No bombs needed for most of it. I died and bombed once or twice on the big plane at the beginning of the stage, seems to help rank.